Help JetBlue and KaBOOM! bring play back to Sandy-impacted communities | KaBOOM! The days, weeks and months of recovery following a hurricane can take a severe toll on a community, particularly on the children who live there. As part of JetBlue’s rebuilding efforts, they are partnering with KaBOOM! to bring the joy of play back to communities that have suffered from the devastating effects of Superstorm Sandy. KaBOOM! is actively outreaching to connect with child-serving organizations that have been impacted by the storm to become KaBOOM! 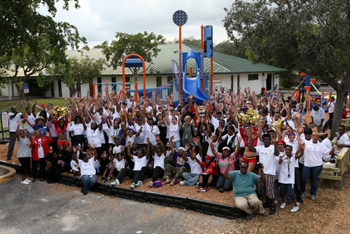 Community Partners for JetBlue’s three (3) playground build projects in 2013. Any group that can demonstrate a physical, financial or social/emotional impact from the storm. Note: Evaluation and screening of applications will not be exclusive to the JetBlue Rebuild initiative but will be against general viability criteria for a KaBOOM! lead Community Partner Playground project and ALL funding opportunities in the New York/ New Jersey area. Help kids in these communities begin the healing process and get back to the important business of being kids. » I am a leader in a Sandy-impacted community. I am interested in having my organization become a KaBOOM! Community Partner. Learn more. » I know a Sandy-impacted community that needs a playground. I want to help them become a KaBOOM! Community Partner. Let us know! » I don’t have a specific recommendation but I’m interesting in volunteering my time. Please keep me informed about the JetBlue playground builds. Sign up below to be informed of volunteer opportunities in your area. To learn more about JetBlue’s rebuilding efforts please visit www.jetblue.com/rebuild.